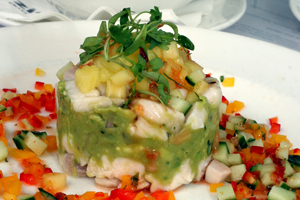 Baja Ceviche Tower taste great. From dinner recipes, budget menus and healthy diet selections, you’ll easily find any recipe you need. Using a round mold add half of the ceviche and press down. Place guacamole on top of fish and push down. Add the rest of the fish push down and then place chopped pineapple on top and push down firmly so when you remove the mold it holds its shape and resembles a tower. Sprinkle the bell peppers, cucumber and green onion around the tower. Drizzle sauce all around the plate so there is a little bit everywhere. Top tower with micro cilantro.